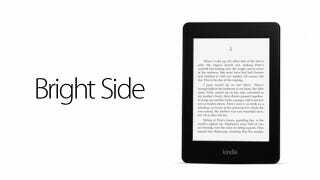 The new Kindle Paperwhite has a frontlit screen. We knew it probably would. But the term "frontlit" is actually a little misleading, and the simplicity of what it does belies the considerable engineering required to pull it off. So what exactly is a frontlit screen, anyway? Other than amazing. Simply, a frontlit display is lit from in front of the display, as opposed to from behind. That sounds pretty straightforward, until you realize that the backlit screens on our phones and laptops and TVs display light by shining a bunch of LED lights directly into your eyes. It's beautiful, but the light coming directly at your eyes gets uncomfortable after a while. By directing the light at the display itself—instead of at your face—frontlit devices save your peepers from a lot of unnecessary strain. Think about it this way: Would you rather read a paragraph by shining a light at a piece of paper, or by having a spotlight shined at your face with cutouts of the letters blacking out the words you're supposed to read? Sound a lot like a book light? Well, it is and it isn't. While the two serve essentially the same purpose—letting you read in the dark—anyone who's used a book light knows that it leaves large swaths of page real estate in the dark. Even on an ereader. The challenge for ereaders, then—one solved by frontlit displays—is to distribute that light evenly. That's no easy task considering that all the light typically comes from one side, and there's no way to shine it straight down from above like your typical book light. So how do they do it? Thanks to the wonders of proprietary research, it's actually not altogether clear. But we can piece together a bit of how the big ereader bosses make frontlighting a reality. Barnes and Noble was the first to launch this current generation of readers with frontlights, and it won't give up what specific material it uses, beyond "a type of glass". The light on its mouthily named Nook Simple Touch with Glowlight seems to flood down from the top of the display, though. Kobo says it collaborated with screen maker E-Ink for its frontlit solution, but didn't provide details beyond that. Likewise, Amazon is mostly mum on Paperwhite, though it has said its secret is using a layer of glass, basically a flattened out fiber optic cable, imprinted with a special pattern. Simply, the pattern captures light with small holes in the glass; the holes are farther apart closer to the lights, where they're brightest, and more tightly packed farther away, to keep the light distribution even. For what its worth, it's also lit from the bottom of the display for an improved viewing angle when you set it down on a table or your lap to read. Ereaders have been doing this—or trying to do it—for years. The Sony PRS-700 had a frontlit display back in 2008. Then again, it also cost $400 and was mind-achingly terrible. But in just these last several months, the technology has finally broken through to become both usable and affordable. Oh, and very, very desirable. ...and is the future of non-LCD gadgets. There really isn't any downside to a frontlit display, beyond a slight cost increase. The Nook actually got lighter when it got its light, and the Kindle paired its frontlit model with an updated display and advanced touch technologies. In the same way the best TVs are also 3DTVs, the best ereaders are also frontlit ereaders. Except you'll actually use the frontlighting. If you're going to nitpick, any damage to the screen becomes a gaping hole of light. But that's sort of misleading, because companies have been making the frontlit screens more durable than the regular models. So if you mess up your screen, it was going to get messed up anyway, and you can still use it as you used to, just with a nick on every single page—the eternal coffee stain of modern digital reading.